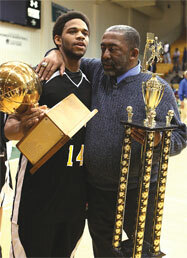 St. Frances Academy student Sean Mosley did what he does best – help lead the Panthers to another win in the Baltimore Catholic League’s 37th-anniversary tournament title. Mosley, the tournament’s Most Valuable Player, scored 35 points as the Panthers defeated the Mount St. Joseph High School, Irvington, Gaels 66-61 in front of a predominantly St. Frances crowd at Loyola College in Maryland’s Reitz Arena in Baltimore. St. Frances Head Coach William Wells, who is retiring at the conclusion of the season, was happy to have his career end this way. “The kids really wanted it, and Sean played really well,” said Wells, who won his sixth BCL Championship – a tie for the most in the tournament’s history. Great defense and hustle contributed to a low-scoring first quarter. The Gaels went into halftime with a 26-23 lead. Seniors Justin McCoy and Quentin Jones, who combined to score 29 points in the game, hit key shots. Senior Henry Sims, who is heading to Georgetown next fall, battled through an injury to help the Gaels lead. The Gaels added to their lead by scoring the first five points of the third quarter to lead 31-23, their biggest lead of the game. It seemed as if the motivational speech sparked the Panthers. Sophomore guard Donte Holmes hit a three-pointer, which was followed by a lay-up. After a quick steal, senior Anthony Oquendo threw down a massive dunk that quickly excited the crowd as St. Frances regained the lead at 44-37. The Panthers didn’t look back as Mosley and Ronald Williams, a freshman, hit clutch free throws to keep the game in favor of the Panthers. Mosley’s 35 points brought his total points in his high school career to 2,844, which is good enough to tie for second place on Maryland’s all-time scoring list. “This was a special year for us,” said Mosley, who received the Most Valuable Player award for the Panthers, who are now 27-8. Both St. Frances and Mount St. Joseph will end their seasons in the prestigious Alhambra Catholic Invitational Tournament, which starts March 14. Fan and critics expect a lot from Mosley, and he showed he can back those expectations up, winning his second Baltimore Catholic League title and second BCL MVP honors.